“What is that?” If you see this poster displayed on a wall on the other side of the street, that’s likely the first question that comes to mind. 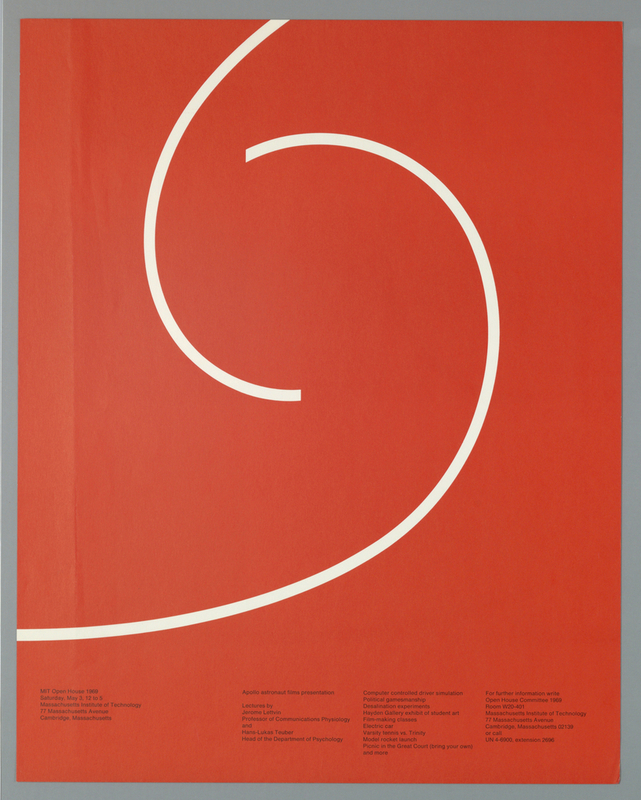 Its bright red color instantly catches your attention, as do the two white curved lines that swirl through part of the poster. Now you get closer to it and take a good look. “What do these two curved lines suggest?” you wonder. Your eyes move to the bottom of the poster where small blocks of text are placed. This poster, the text tells you, is supposed to publicize an open campus event at the Massachusetts Institute of Technology (MIT). Now you know what this poster is for, but the mystery of the two lines remains unsolved. “My job is to stop anyone I can with an arresting or puzzling image, and entice the viewer to read the message in small type and above all to attend the exhibition,” Jacqueline Casey, the poster’s designer, once said. Though she was referring to her poster design for exhibitions, Casey employed the same strategy for almost every poster she did for MIT, where she served as a graphic designer—and eventually the head of design services—for more than thirty years. She considered how posters communicate with viewers. When we look at a poster, visual and textual information is processed through the brain so quickly that we never realize when and how we understand what’s in front of us, unless each step is tracked consciously. This poster exemplifies the way Casey employed a unique set of design elements to guide a viewer’s eyes. There might be no right answer to the question about what the two white curved lines represent. One might think that the two lines are about to encounter one another and mingle, which alludes to the concept of an open campus event in general. Others might think that the image of the two curved lines is a close-up of a larger image, which can be read as a metaphor for the comprehensiveness of the event. The mystery becomes a possibility for imagination and interpretation, perhaps exactly the way Jacqueline Casey would have wanted. Liz McQuiston, Women in Design: A Contemporary View, (London: Trefoil, 1988), quoted in Elizabeth Resnick, “Woman at the edge of technology,” eye magazine, No.68, Summer 2008, accessed March 3, 2016, http://www.eyemagazine.com/feature/article/woman-at-the-edge-of-technology. Jacqueline S. Casey and Ellen Lupton. MIT/CASEY, (New York: Herb Lubalin Study Center of Design and Typography, 1989), 1.